Our sins have separated us from God. God is holy. He is separated from all evil. The problem is, we are not. God cannot have fellowship with the wicked. We are wicked. We’ve sinned against everything especially the Holy creator of the universe. God would still be just and still be loving if He threw us into hell for eternity. God doesn’t owe us a thing. Out of His great love for us He came down in bodily form. Jesus lived the perfect life we couldn’t live and on the cross He took our place. A criminal has to be punished. God measured out the punishment. God crushed His sinless Son. It was a painful death. It was a bloody death. Jesus Christ paid for your transgressions in full. Jesus reconciled us to God. Because of Jesus we can get to know God better. Because of Jesus we can get to enjoy God. Because of Jesus Christians are confident that Heaven will be awaiting us at the finish line. God’s love is evident on the cross. Salvation is all of grace. All men must repent and believe on Christ. Christians have full assurance that Jesus took all our sins away. Jesus is our only claim to Heaven. We must understand that God shows the greatest example of humility. He was rich, but became poor for us. He came in the form of man for us. He died for us. We must never hold a grudge against anyone. Christians should always seek reconciliation with friends and family even if it isn’t our fault. We are to be imitators of God who forgave us. Confess your sins towards each other, pray for your brothers and sisters, and do your conscience a favor and restore your relationship with others. Jesus Christ is the advocate for sinners. 1. 1 John 2:1-2 My little children, I’m writing these things to you so that you might not sin. Yet if anyone does sin, we have an advocate with the Father—Jesus, the Messiah, one who is righteous. It is he who is the atoning sacrifice for our sins, and not for ours only, but also for the whole world’s. 2. 1 Timothy 2:5 For there is only one God and one Mediator who can reconcile God and humanity–the man Christ Jesus. 3. Hebrews 9:22 In fact, according to the law of Moses, nearly everything was purified with blood. For without the shedding of blood, there is no forgiveness. 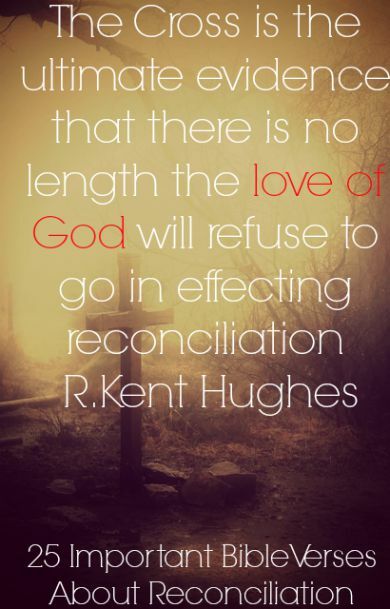 Through Christ we are reconciled to God. 5. Romans 5:10-11 For if, while we were enemies, we were reconciled to God through the death of his Son, how much more, having been reconciled, will we be saved by his life! Not only that, but we also continue to boast about God through our Lord Jesus the Messiah, through whom we have now been reconciled. 6. Romans 5:1-2 Now that we have God’s approval by faith, we have peace with God because of what our Lord Jesus Christ has done. Through Christ we can approach God and stand in his favor. So we brag because of our confidence that we will receive glory from God. 7. Ephesians 2:13 But now in Christ Jesus you who once were far away have been brought near by the blood of Christ. Together as one body, Christ reconciled both groups to God by means of his death on the cross, and our hostility toward each other was put to death. 8. Ephesians 2:16 Together as one body, Christ reconciled both groups to God by means of his death on the cross, and our hostility toward each other was put to death. 9. Colossians 1:22-23 he has now reconciled by the death of his physical body, so that he may present you holy, blameless, and without fault before him. However, you must remain firmly established and steadfast in the faith, without being moved from the hope of the gospel that you heard, which has been proclaimed to every creature under heaven and of which I, Paul, have become a servant. 10. Acts 7:26 But now through Christ Jesus you, who were once far away, have been brought near by the blood of Christ. 11. Colossians 1:20-21 and through him to reconcile to himself all things, whether things on earth or things in heaven, by making peace through his blood, shed on the cross. Once you were alienated from God and were enemies in your minds because of your evil behavior. Reconciling our relationship with others. 12. Matthew 5:23-24 So then, if you bring your gift to the altar and there remember that your brother has something against you, leave your gift there in front of the altar. First go and be reconciled to your brother and then come and present your gift. 13. Matthew 18:21-22 Then Peter came up and asked him, “Lord, how many times may my brother sin against me and I have to forgive him? Seven times?” Jesus told him, “I tell you, not just seven times, but 77 times. 14. Matthew 18:15 Moreover if thy brother shall trespass against thee, go and tell him his fault between thee and him alone: if he shall hear thee, thou hast gained thy brother. 15. Ephesians 4:32 Instead, be kind to one another, compassionate, forgiving one another, just as God in Christ also forgave you. 16. Luke 17:3 Watch yourselves! If your brother sins, rebuke him. If he repents, forgive him. 17. Colossians 3:13-14 Put up with each other, and forgive each other if anyone has a complaint. Forgive as the Lord forgave you. Above all, be loving. This ties everything together perfectly. 18. Matthew 6:14–15 Yes, if you forgive others for their sins, your Father in heaven will also forgive you for your sins. But if you don’t forgive others, your Father in heaven will not forgive your sins. We must never let pride get in the way. God humbled Himself and we must imitate Him. 19. Proverbs 11:2 When pride comes, then comes disgrace, but with the humble is wisdom. 20. Philippians 2:3 Let nothing be done through strife or vainglory; but in lowliness of mind let each esteem other better than themselves. 21. 1 Corinthians 11:1 Be imitators of me, as I am of Christ. 22. Matthew 7:12 Therefore, whatever you want others to do for you, do also the same for them–this is the Law and the Prophets. 22. Matthew 5:9 “How blessed are those who make peace, because it is they who will be called God’s children! 24. Ephesians 4:31 You must put away every kind of bitterness, anger, wrath, quarreling, and evil, slanderous talk.